The exchange rate determines how much one currency trading unit is worth in relation to another. 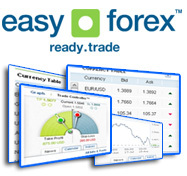 Example: for the currency trading pair EUR/USD worth 1.2882 / 85, one EUR is worth $1.2882. Currency trading is influenced by exchange rates whenever demand for the currency is greater than supply, when the currency price increases. Exchange rates are influenced by various economic indicators, among which are increased transaction demand for the currency and increased speculative demand for money. Exchange rates are very influential on currency trading profits and losses, and should be monitored by traders constantly. These factors are monitored and balanced by central banks, even though it is much harder for them to adjust speculative demand for currency trading, which is done through the adjustment of interest rates. Exchange rates fluctuate around a certain price, and by figuring out what is this average you can invest more accurately in currency trading. Many variables influence exchange rates, and to be familiar with them all you need to read more about fundamental analysis. Using various currency trading techniques, you can analyze exchange rates and try and understand the reasons for the trend directions. The exchange rates for major currencies are relatively stable, and this has both advantages and disadvantages, depending on the sort of investor you are.